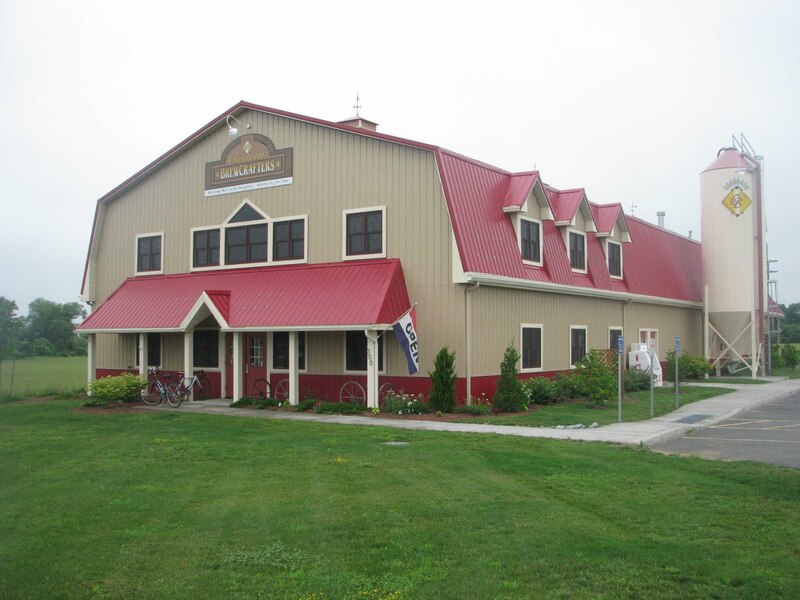 A few weeks back while Jeff and I were visiting family in Upstate New York, the two of us took the opportunity to visit one of the local breweries: Custom BrewCrafters (CBC) in Honeoye Falls, NY (just outside of Rochester). 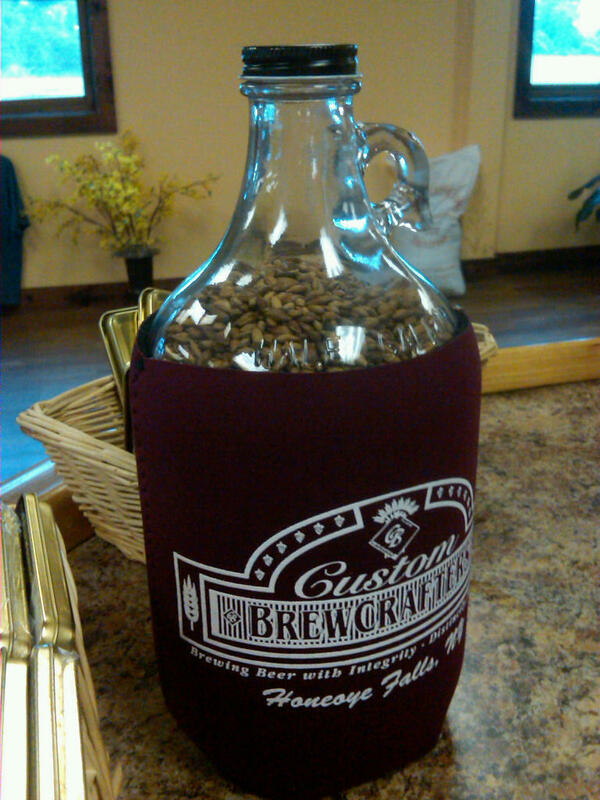 Custom BrewCrafters is a unique brewing business in that it focuses almost solely on contract brewing. The business, founded by Mike and Luanne Alcorn in 1997, took advantage of the opportunity Alcorn saw in crafting specialty beers for Western New York restaurants. The company’s value proposition was to help create and brew “house” beers for customers’ establishments. Alternatively, CBC also offered a stable of their own beers/recipes, many of them award winning, including a two time GABF medal winner. CBC’s customers accept the beer under specific contract conditions, along with their own label, and serve the beer directly on draft in their restaurants. All the Custom Brewcrafter beers are brewed within the company’s new brewery location outside of the town of Honeoye Falls. 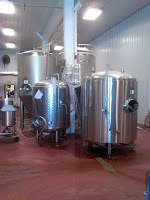 The facility also operates a tasting room like those found at small wineries. It has a bar with approximately 20 taps, where people pay a nominal fee (~$3) and get six small tastings. The tasting room staff is on hand to answer questions, offer tours, and sell growlers pulled fresh from the taps. Additionally, kegs, 12-ounce, and 22-ounce bottles of several of the beer varieties are also sold on site. Operating the tasting room, as well as tours of the brewery, seem to generate buzz for the breweries brands, as well as finding homes for any kegs that may not be moving as quickly as otherwise optimal. Jeff and I found the Custom BrewCrafters business model to be very novel. It does not follow either the traditional brew pub model or the small/regional craft brewery model. The company exists to supply local restaurants with local beer; beer that those restaurant owners help to develop. For many years, contract brewing carried with it a negative stigma in the craft brewing industry. This negative connotation began when the industry was undergoing massive growth and everyone wanted a piece of the pie. The results from this period of contract brewing were poor quality beer that were marketed under many names and labels. It is refreshing to see that contract brewing, as done at Custom BrewCrafters, is shaking the negative stigma. The beer that Jeff and I sampled was interesting, varied, and of quality. If establishments like Custom BrewCrafters can continue to prove that contract brewed beer is worthy of the label of craft beer, than that is better for all of us, because it allows more brands with innovative ideas to enter the marketplace. If any of our readers find themselves in the Rochester, New York area (specifically near Honeoye Falls), I highly encourage you to stop by for a visit. You will not regret it.